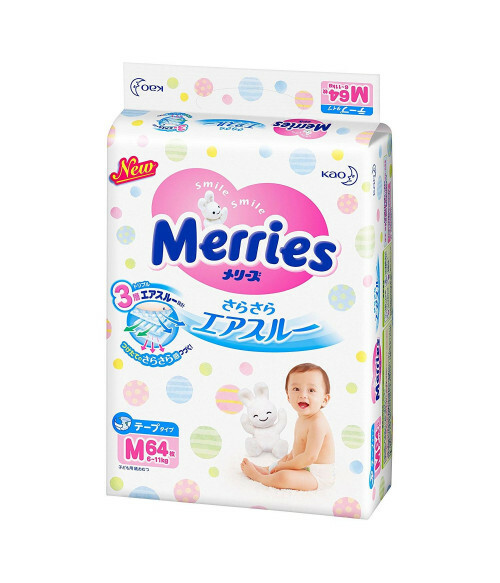 Speaking about diapers Merries, produced in Japan, they have excellent customer reviews.These diapers are thin, exceptionally soft, and perfectly fit a child's abdomen and legs. However, these diapers perfectly absorb and do not leak. With diapers Merries one can forget about diaper rash and itching, thanks to the healing extract of Witch hazel, which has anti-microbial and anti-inflammatory action. Also the Japanese diapers Merries (Merries sizes M, L, XL), have a special "breathable" gum with exceptional breathability. It is located along the gum of the belt in a diaper and now the kid who has been actively moving in Merries is always dry and comfortable, because the belt, where he quickly formed a sweat, is now dry. A flexible non-woven material isused when the “breathable” gum is produced, which gently stretches and compresses the waist of your baby. 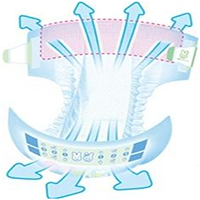 "Breathable"diaper gum of Merries stays well adjacent to the belt the whole day according to the movement and breathing of the child; and the edge of the diaper does not crash into the tummy and does not cause reddening. When you spread out a diaper Merries for the youngest babies (sizes N B and S), special barriers on the edges of the diaper will also spread themselves out "rise " and gently girth your baby's legs, so it will be able to hold the baby’s liquid waste in the diaper itself very well. Indicator in Merries-three special lines will let you know that the baby has peed. The lines in the center of the diaper will become blue when you need to change the diaper. 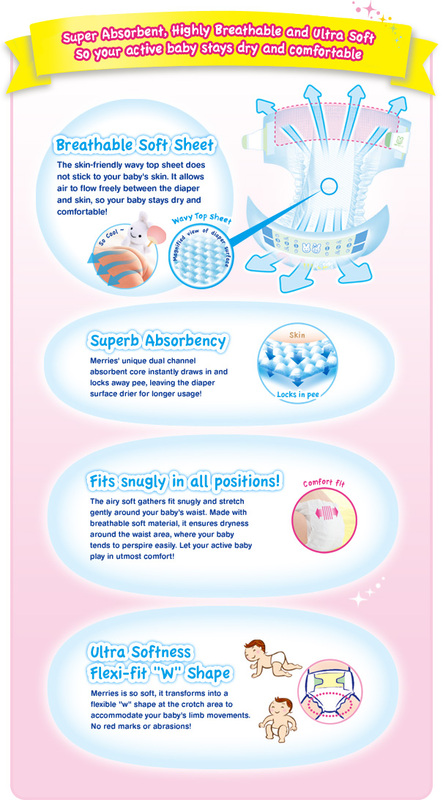 Japanese diapers Merries are made of the materials that passed strict and thorough quality check. Soft cotton material that makes up the diaper will protect your baby from having chafing. Pull-ups Merries are made of:polyolefin, non-woven polyester, cotton linters, paper, super absorbent polymer, polyolefin film,non-woven polypropylene,polyurethane, and hot melt. best diaper ever! both of my 2 kids use merries diaper since they were born. I dont usually write reviews, but this time i want to share my experience. I ve tried many many different diaper brands so far: Pampers, huggies, honest diapers, babyganics, seventh generation etc.. And the japanese are simply the best! They dont have that artificial smell, they are very stretchy, soft as cotton, and the most important - dry! I used to buy Moony which are very good, but now i order Merries. Seems they fit better to my baby. I also recommend the store "thebestfromjapan". Always get exactly what i order, always promptly shipped, always delivered on time, the price is cheaper than on Amzn. Good customer service! Thank you! I am from Canada and I've ordered from them 2 times and i am very happy , no issue with my order and it was delivered really fast. Also, love this diapers.